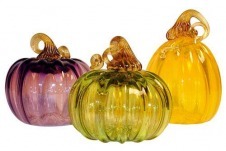 Glass pumpkins you can leave out all year! Finding his passion for glass long before he found out how to express it, John Riepma remembers some of the most vivid memories of watching flame-workers at craft fairs and the glassblowers at Colonial Jamestown. A simple stained glass panel which his grandparents brought with them when they emigrated from the Netherlands and which Riepma inherited, was the inspiration for his introduction to the world of stained glass in the 1980’s. After several years of working in stained glass, Riepma was invited to taking a beginner’s glassblowing class by two friends. From there, he was immediately hooked and determined to learn the craft himself. 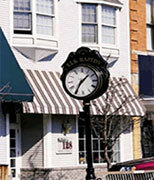 Riepma is a machine builder and designer by trade, and did the research necessary to design and build all of the equipment that he presently uses in his studio.